Los Angeles—The Golden State Warriors eased to the top of the Western Conference on Wednesday, outclassing an under-strength San Antonio Spurs to score a comprehensive 141-102 win at the Oracle Arena. San Antonio coach Gregg Popovich rested star players LaMarcus Aldridge and DeMar DeRozan citing “load management”, and could only watch as the powerful Warriors romped away with an emphatic win. The reigning NBA champions started with five NBA All-Stars in their line-up—Kevin Durant, Draymond Green, DeMarcus Cousins, Klay Thompson, and Stephen Curry—and had opened up a 66-52 lead at half-time. 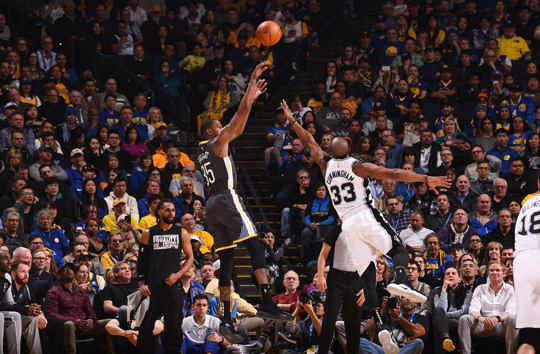 An explosive third quarter saw the Warriors outscore their opponents by 49-31 to make the fourth quarter a formality. Warriors coach Steve Kerr was satisfied at the ruthless streak shown by his side against their depleted opponents. “Reality kind of set in terms of the talent disparity with their guys being out,” Kerr said. “We kind of wore them down. It’s important on a night like tonight when you know that the other team’s best two players aren’t out there, that you stay focused. Thompson led the scoring with 26 points for the Warriors, with Durant posting 23 points and Curry 19. Cousins also had 15 points while Kevon Looney and Andre Iguodala had 11 off the bench. The Warriors now lead the West with 38 wins and 15 losses, pulling 1.5 games clear of second-placed Denver, who suffered a 135-130 defeat to Brooklyn. D’Angelo Russell once again led the scoring for the Nets with 27 points on a night when seven players cracked double digits for Brooklyn. The defeat left Denver second in the West with a record of 37-17. Elsewhere Wednesday, James Harden extended his red-hot scoring streak as the Houston Rockets overwhelmed the Sacramento Kings on the road. Harden scored 36 points in a 127-101 win for the Rockets, the reigning MVP’s 28th straight game where he has scored 30 points or more. The win saw Houston improve to 32-22, leaving them in fifth spot in the Western Conference playoff race. In the East, Giannis Antetokounmpo underscored his potential MVP credentials with a scintillating 43-point display as the Milwaukee Bucks bagged their 40th win of the season with a 148-129 rout of the Washington Wizards. Antetokounmpo led a dominant offensive display by the Bucks, who now own the best record in the NBA and lead the Eastern Conference Standings with 40 wins against 13 defeats. It was the latest in a series of superb performances this season by Antetokounmpo, who has thrust himself firmly into the conversation for MVP honours in recent weeks. “Just tried to be aggressive coming into the game, trying to make plays for my team-mates,” the 24-year-old Greek forward said. Milwaukee earned their fifth straight win after pouring on 50 points in the first quarter against a Wizards side who were rarely in contention. Milwaukee led 85-65 at half-time and although the Wizards stormed back with a 42-point third quarter, the result was never seriously in doubt. Antetokounmpo drained all three of his three-point attempts as he made 17 of 21 attempts. Antetokounmpo was one of six Bucks players to make double figures, with Eric Bledsoe posting 22 points along with 11 assists and six rebounds. Malcolm Brogdon made 18 points and Khris Middleton finished with 16. Ersan Ilyasova added 12 from the bench. Washington also poured on the points, with Bradley Beal adding 30 while Thomas Bryant finished with 26. Jeff Green had 22 points.